Papergirl Cardiff is back again this year, organised once again by a collaboration of ThinkARK members, Cycle Training Wales and The PrintHaus arts collective and print studios. Papergirl is a global art and cycling event that originated in Berlin following a city council ban on flyposters. 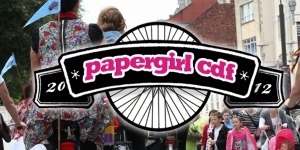 Papergirl events are also happening this year in Dublin, Leeds, Birmingham and Brisbane, with more being announced monthly. The general idea of Papergirl is the distribution of free, original artwork to the general public by bicycle. Artwork is donated by professionals and amateurs alike, exhibited and then distributed to random people on the city streets. Last year Papergirl Cardiff distributed 300 pieces of artwork over the course of an hour long bike ride through the city. People who took part in the ride last year really enjoyed themselves but wished that the ride was longer. So this year we need even more artwork submissions! We try to get as many people involved as possible, contacting artists, galleries, schools and colleges and putting out world-wide calls for artwork. We also run half-term print workshops at The PrintHaus to give children a chance to submit artwork and learn about screen printing. The submission date for artwork is Friday 11th of May 2012 with exhibition and ride dates TBC.